Department of Mechanical Engineering, Univercity College of Engineering JNTUK. Department of Mechanical Engineering is established from the inception (1946) of the institute to meet the requirements of the mechanical industry and the society /discipline after the consultation with various stakeholders. The department started with an initial intake of 40 students in UG Program in ME and the intake is enhanced to 50 in the year 1976. In 1972, the department started a PG Program in “Machine Design (MD)” with an initial intake of 12 and the intake is enhanced to 18 students in the year 2001 again 18 to 25 in the year 2008. 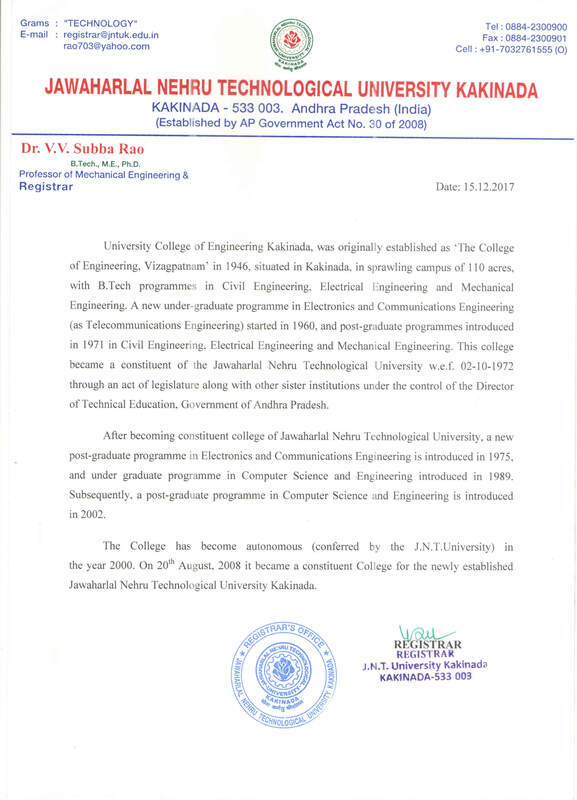 The department also started another PG Program in “Computer Aided Design and Computer Aided Manufacturing (CAD/CAM)” in the year 2001 with an initial intake of 18 and the intake is enhanced to 25 students in the year 2008. 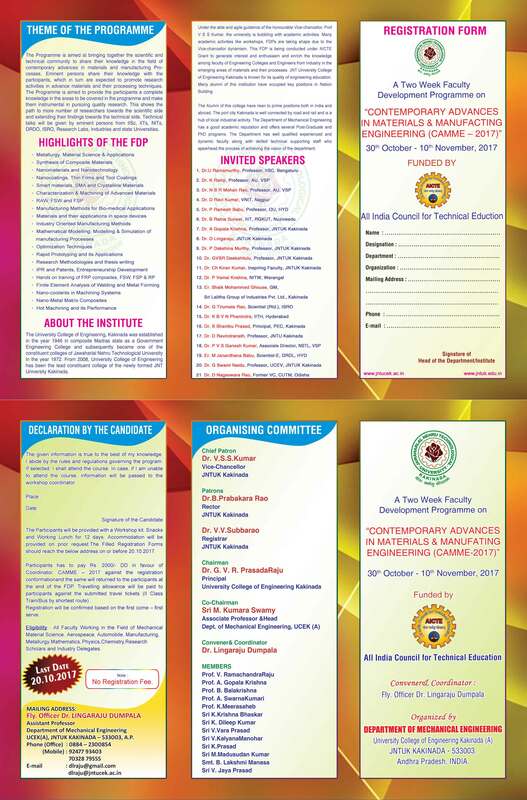 To nurture the excellence in modeling, design and of modern mechanical engineering systems by imparting timeless core values to the learners and to mould the institution into a centre of academic excellence and advanced research. To offer high quality graduate and post graduate programs in Mechanical Engineering in order to mould the learners into globally competitive technologists who are professionally challenged, intellectually influenced and socially responsible. The department strives to make the learners inculcate and imbibe physical and practical perception and pro-active nature so as to enable them to acquire a vision for exploration and an insight for advanced technological innovations. PO1: Able to understand the fundamentals of the basic sciences, engineering and develop mathematical and analytical skills required for professional practice of Mechanical Engineering. PO2: Develops and motivate themselves from the infrastructure at their disposal to secure a place in the fields of their interest or pursue higher education as a solution to meet the challenging problems of engineering world. PO3: Ability to demonstrate successful careers in industry with viable technical skill in the design, production, construction of mechanical systems. PO4: Produce graduates to function ethically and responsible socially towards their peers with commitment to lifelong learning, and exhibit good competency in their work culture. PEO 3: To enable students for lifelong learning and introduce them to professional ethics and sustainable development and an attitude towards self-employment through entrepreneurship. PEO 4: To prepare students for successful careers in industry to meet the needs of Indian and Global companies. PEO 1 : Excel in professional career and/or scientific research by acquiring knowledge in advanced mathematical, computational and engineering principles. PEO 2: Analyze real life problems and design eco friendly mechanical systems as an appropriate promising solutions that are technically sound, economically feasible and socially acceptable. PE0 3: Exhibit professionalism, ethical attitude, communication skills, team work in their Profession and adapt to current trends by engaging in lifelong learning. PE0 4: Inculcate or imbibe entrepreneurship quality to establish professional industry with wide spread technological facilities as a global competitor. PO 1: Develops an ability to invoke knowledge of mathematics, science and engineering to the challenges in the engineering world. PO 2: Gains an experience to design and conduct experiments to analyze and interpret data system behavior. PO 3: Exercises a skill to design component or process to meet desired needs within practical constraints such as economic, environmental,social, political, ethical, health and safely. PO 4: Practices to function with a multi/interdisciplinary teams. PO 6: Inculcate an ability to communicate effectively and understands the professional ethical and social responsibility. PO 7: Executes projects and understand how an organizations works. PO 8: Understands the impact of engineering solutions in a global, economic, environmental and societal scenario. PO 9: Recognition of the need for, and an ability to engage in life-long learning process. PO 11: An ability to use the methods, techniques, skills, and modern engineering tools or modules necessary for engineering practice. PO 12: To provide the students with a profound knowledge in the areas of design, thermal production and manufacturing. PO1: To get the mathematical and engineering knowledge to solve real life problems in design and manufacturing systems. PO 2: To acquire the basic skills to model and analyze the mechanical engineering problems. PO 3: To get the capabilities to manufacture the components efficiently using advanced manufacturing processes. PO 4: To provide competence to investigate, solve and optimize complex problems. PO 5: To learn the basic computer aided tools which includes computer graphics, geometric modeling, finite element analysis,.etc. PO 6: To manufacture the products to cater the needs of the society emphasizing on improving quality, production and productivity. PO 7: To design and manufacture the components considering also environmental issues and sustainability. PO 8: To expose to the diversified applications of the CAD/CAE such as motion analysis, structure analysis, dynamic analysis, vibration analysis..etc. 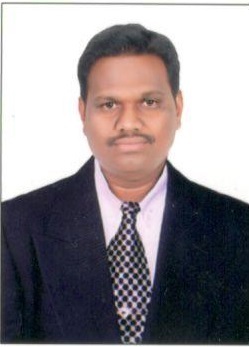 PO 9: To get acquaintance with diversified applications of CAM based on industrial robotics, rapid prototyping, reverse engineering , virtual engineering, CAPP,..etc. PO 10: To enable continuous learning and improvement by getting exposed to latest technologies like nano materials, nano coatings, mechatronics..etc. PO 1: Ability to apply knowledge of advanced computational tools, mathematics, and modern trends in Machine Design. PO 2: Ability to analyze a problem, identify and formulate several computational methods requirements appropriate to its solution. PO 3: Ability to design, implement, and evaluate new approaches, to the problems, processes, components, to meet desired needs with appropriate consideration for public health and safety, cultural, societal and environmental consideration. PO 4: Ability to design and conduct experiments, as well as to analyze and interpret data. PO 5: Ability to use current techniques, skills, and modern tools necessary for innovative practice. PO 6: Ability to analyze the local and global impact of various design techniques on individuals, organizations and society. PO 7: Imbibe an ability to design or develop new computational tools for easy and accurate solutions. PO 8: Understanding of professional, ethical, legal, security and social issues and responsibilities in the design of new engineering systems. PO 9: Ability to function effectively individually and on teams, including diverse and multidisciplinary, to accomplish a common goal. PO 10: Ability to focus on the research activities appropriate to the discipline. PO 11: Recognition of the need for and an ability to engage in continuing professional development and lifelong learning. PO 12: Understanding of engineering and management principles and apply these to one’s own work, as a member and leader in a team, to manage projects.